I am fully aware of the EMI-prone, latch-up prone, rectifying and sometimes very noisy, LM4562/LME49720 and now-discontinued LME49860. Does anybody know if this is also a problem for the current production LME49724? I was kinda eyeballing that thing after seeing it's data sheet. This thread is shocking and then I went and found a closed thread on the TI forum about periodic noise from the LME49724, with very ugly spectral plots. At least a TI employee popped in to say it looked to him like a process problem. There was very little else to be found about it. Maybe that is good or really bad hard to say from my point of view. Does TI improve the process over time and the one bad instance mentioned on the website is a fluke of nature, never to be heard of again or something else? I am shocked to see Texas Instrument continue publishing datasheets for these op-amps tooting low noise: 2.7 nV / rt Hz. And they continue to sell an op-amp they have discontinued without any warning like "not for new design". Clearly, they clear their stock of odd balls onto unaware clients. Is the LM4562 -same chip as LME49720- manufactured through the very same process ? Is there a chance LM4562 is free from "pop corn" noise. BTW, I am sorry for my clumsy wording "please double check", I just wanted to make sure of the data I had seen on the data sheets, there was no other intention. The LM4562 is exactly the same chip as the LME49720. The only difference is the laser-marking. National introduced the LM4562 and then discovered JRC had used the same part number. If they could get the process cleaned up to eliminate the popcorn noise then we could deal with the EMI issues. Looks like they brought the SMT version of the LME49860 back. There is a low distortion oscillator thread at DIYaudio where me and a couple of other guys talk about the EMI issues with the LME49720. The problem TI has with screening for burst noise is the amount of time the IC would have to sit in the test socket. It might take up to 30 seconds for the part to have one of its noise burst fits. Kinda like an IC with Tourette's syndrome. I just received notice that I'll have 4 prototype boards tomorrow. eggzactly... They could sell a guaranteed low noise version but who would buy the fall out chips, especially if there are too many to discard. Got the boards in today and assembled. Layout passes DC tests and has gain. The ZTX851 are not physically bonded at the moment. The layout is perfect - on the next spin I'll move a couple of component designators on the silkscreen to keep them from being swallowed up by a via or component hole. Other than that I'm not going to touch a thing. More tests to follow as soon as I clean off the workbench. The best part about a project reaching this stage is emptying the ProtoBoard and the big check mark on the electronics bucket list. I use the Kenner Easy Bake Oven (aka Express PCB). The output noise floor is -80.19 dBu indicated. 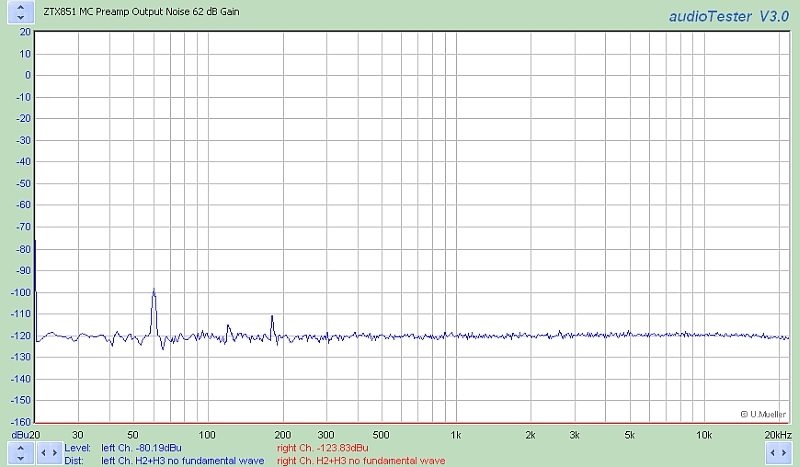 There is 0.74 dB loading by the A/D so the actual output level, unweighted, is -79.45 dBu. The measured gain is +61.61 dB. Thus, the Ein is -141.06 dBu. Subtracting Rsouce+Rgain from Rnv leaves 3.5Ω. Thus rbb' is estimated to be around 1.75Ω per transistor. 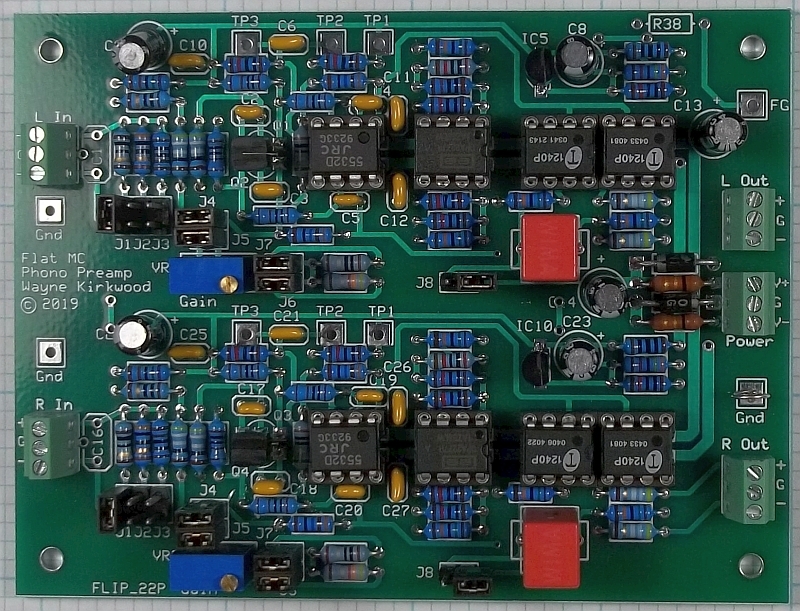 The NF for a 10Ω source is 1.6 dB.